Thirteen teams entered the 2017 Dollar Cup, the first of Cowdray Park’s annual series of six HPA tournaments open to allcomers. 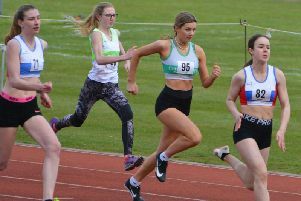 Emma McCarthy’s Emlor C made it through to the final, having won all their league matches, but lost at the last hurdle to Darko Horvat’s Foxcote. Horvat, playing off -1, was joined by three-goal player Tom Beim at No2 in the Foxcote team with England player Ollie Cudmore (five goals) at three and Argentine five-goaler Jacinto Crotto at back. McCarthy’s no-goal handicap was complemented by English players Jack Richardson (6 goals) at three, Henry Fisher (four goals) at back and the talented young two-goal Argentine player Jose Ramon Araya at two. Emlor C made a feisty start with Richardson and Fisher steering the ball away from Foxcote and setting up McCarthy for a shot at goal. The whistle blew and a 30-yard penalty gave Richardson the chance to put Emlor C in the lead. With the action flying along at a great pace, the first chukka concluded with the score remaining 1-0 in Emlor C’s favour. The first score in chukka two saw another penalty awarded to Emlor C and Richardson sending a lofty 60-yard shot between the posts to take the side on to 2-0. Crotto won the throw-in and raced away, riding past Richardson’s defence, Cudmore joined in the attack and the whistle blew again. Crotto lost little time in sending a 30-yard penalty shot in Foxcote’s favour between the posts. The pace continued with attacking play by both sides, each looking for the elusive route to goal. Finally, young Araya chased Cudmore long enough to grab the ball from him and pass to Richardson who carried the ball all the way through Foxcote’s goal posts to take his team on to 3-1. Richardson missed the next penalty awarded to Emlor C. Crotto brought the ball in, Cudmore latched on to it and although a brave defence was made by McCarthy, Foxcote’s No3 regained possession and was off, racing down the field to bring the side within one goal of Emlor C at half-time. A surprising chukka three saw the red shirts of Emlor C racing all over the pitch but unable to consolidate their position. A 30-yard penalty was given away enabling Foxcote to equalise at 3-3 with a shot from Crotto. Cudmore won the ball from the throw-in, Richardson tried to stop him but a bouncing ball enabled Cudmore to steal it back and gallop away to score a super field goal. Foxcote were ahead for the first time at 4-3. Crotto won the next piece of play, grabbed the ball and helped Foxcote end the third chukka 5-3 ahead. The yellow shirts of Foxcote dominated the match from the beginning of chukka four. Once more a whistle stopped the match and a 60-yard penalty was awarded. Crotto sent an accurate ball high over the goal posts and Foxcote went 6-3 ahead. Emlor C were not so lucky. When Richardson tried to send a similarly lofted 60-yard penalty shot through the posts the tricky wind was against him. When the ball came back into play, Araya did his best to move it up the pitch but lost it over the boards. Cudmore raced away from the line-out with Fisher in pursuit. Into the frame once more came Crotto, who raced off to score his fifth goal of the afternoon and 7-3 on the board for Foxcote. Cudmore made a shot at goal which went wide. The ball came in, Fisher passed to McCarthy, Richardson took over and passed to Araya who found the space to turn and with excellent control sent the ball between the posts to recoup a goal for Emlor C.
But the red shirts had left it too late and the Foxcote side were able to claim victory in the 2017 Dollar Cup with a final score of 7-4. Laura McCarthy was delighted to present the trophy to her sister Emma and prizes to all players. The Polo Times Best Playing Pony award went to Fiasco owned by Ollie Cudmore and Jacinto Crotto was awarded The Polo Magazine’s Most Valuable Player prize. In the subsidiary final, Jeremy Pemberton’s Conosco beat John Gunn’s Inspirit/Kildare 8-6.